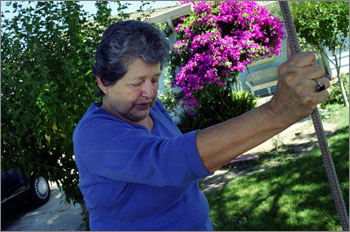 Pillar of Strength: Georgette Sanchez holds onto a tire swing as she walks around the front yard of her Campbell home. Her daughter, Jeanine Sanchez Harms, has been missing for almost three months. The house, Jess says, was to be left to Jeanine and her brother, Wayne, so that Jeanine would never have to worry about buying her own home. But all that's changed since Jeanine, 42, vanished from her Los Gatos home almost three two months ago. Georgette says she dislikes large groups and avoids being the center of attention. After Jeanine disappeared, their oldest son, Craig, the official family spokesman, protected them from the media spotlight. Attempts by this reporter and other members of the press to speak with Jess and Georgette were politely refused. Craig, however, had to go back to his home in Maryland at the end of August, and now Jess and Georgette are making themselves slightly more accessible--including the occasional interview and appearing at some events in Jeanine's honor. They want to keep the case and Jeanine in people's minds, they say. I requested to meet with Jess and Georgette the following week, and they consented. Their home had been off-limits to the press (an August interview with "American's Most Wanted" was held at someone else's house), and I expected to meet them at a restaurant or other neutral ground. But Jess said, "Why don't you come to the house?" Jeanine Sanchez Harms' parents could be anyone's next door neighbors. Jess, 75, is of Mexican descent, dark-skinned, with a shock of white hair. He is close to 5 feet, 9 inches tall and wears bifocals. Georgette, 76, has a fair complexion--she is half-French and half-Mexican--and is usually soft-spoken. Both are retired educators. Jess was a Spanish teacher at Del Mar High School in San Jose when it first opened and retired as the principal of Los Altos High School in 1985. Georgette taught English as a second language and bilingual classes until 1985 at Cesar Chavez Elementary in San Jose. They have been married 52 years, and she still calls him "hon." Family photos adorn the walls of the Sanchez home--the grandchildren as babies; Georgette as a beautiful, young woman; the five of them in the '70s, with one of the sons dressed like a hippie; Jeanine as a bride in 1995. Her marriage to Randy Harms would end almost five years later. Georgette says that it's hard being patient. "I want to run up and down the street and look in the houses and see what's there," she says. When they realized that Jeanine was missing, "we though it was a mistake," Georgette says. "We're not stupid, but we're a very hopeful kind." The Sanchezes say they never thought something like this could happen to them. "We always expect everything to be all right," Georgette says. "Some days I feel strong; some days I crumble at anything," Georgette says. A good day, Georgette says, is "when the family comes over and we talk about things that make me forget [about the case]." Jess has eight surviving siblings, most of whom stop by the house every day. Or, Georgette says, it's when "the girls"--Jeanine's closest friends Chigiy Binell and Janice Burnham--visit, and they all go into the garden and talk. A bad day for Georgette is one that begins with something that upsets her, and she can't shake the mood. 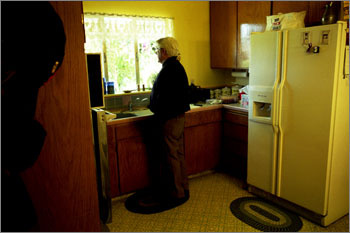 Watching and Waiting: Jess Sanchez stares out the kitchen window of the house that Jeanine Sanchez Harms grew up in. Lucy Sanchez Crumpton, Jess' sister and a Los Gatos resident, also drops by to give Georgette a birthday gift. As we leave, she tells me that it's hard on Jess and Georgette, but they are holding up remarkably well. Chigiy (pronounced CH-GEE) has known Jeanine since they were children. "Life is just going to go on, but it's going to be a sadder and lonelier place," she says. "There's just a void and a hole ... and you can't move on from that stop." Chigiy owns the duplex on Chirco Drive that Jeanine moved into in April. When I talk to Chigiy, she is gardening in the backyard of the duplex. She says she usually doesn't speak about Jeanine using the past tense. "I don't even do that with my mom, and I know that she's dead," Chigiy says. Jess and Georgette didn't learn of Nasmeh's identity until they saw the police-issued flier with his name and photograph, along with a picture of Jeanine. The Sanchezes say that they wonder why Nasmeh's photo was released, but Wilson's was not. My attempts to reach Nasmeh was unsuccessful.